This review originally ran in the Friday, August 17, 2012 issue of Shelf Awareness for Readers. If you don't already subscribe, sign up here to receive a bi-weekly dose of readerly goodness in your inbox. On a quiet street in London, a chauffeur is sleeping with his master's daughter--and his master's wife. Down the street, in exchange for pocket cash, another family's au pair helps sneak into the house her mistress's lover, a man who happens to be a famous soap opera actor and grand-nephew to the stuck-up housekeeper of a princess of dubious origin. The local gardener believes that his god is speaking to him through his cell phone, setting him on a mission to destroy the evil spirits he sees around the city. 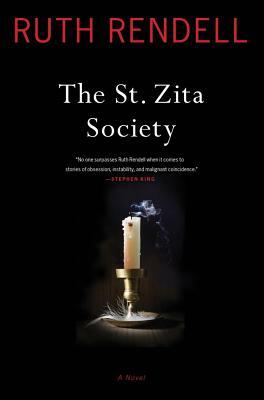 This unlikely cast of characters bands together in a haphazard society that they call the St. Zita Society, named for the patron saint of domestic servants. The St. Zita Society, a standalone novel from the delightfully imaginative mind of Ruth Rendell, is a gripping portrayal of the London world of servants and their masters, all marching toward an inevitable--and violent--conclusion. Rendell approaches the inner lives of her characters with a detailed, probing eye, bringing them to life with her sharp and clever writing. Her shockingly normal characters--a housewife with an obsession for exercise and tight jeans; an absent husband who throws himself into his work; a lazy au pair with a knack for doing as little as possible--only make the suspense all the more striking. Rendell has written more than 50 novels, and the The St. Zita Society, a brilliantly crafted novel of psychological suspense, further enforces her rightful place as the queen of British mystery writing. Intriguing and a lot of goings on! sounds good. harrah's resort atlantic city on jan.